December is time for the holidays, a time to spend time off celebrating with friends and family and ringing in the new year. Many are able to enjoy fun winter pastimes, like sledding or skiing, and coming home to a cup of hot cocoa. During the break is a great time to reflect on 2017, to celebrate the good news, and to learn what to improve on in the coming years. Zuriel Oduwole is a filmmaker who has produced five films with her newest one called Follow the Ball for Education, with all of her films having focus on Africa and girls’ education and rights. The Follow the Ball for Education film correlated with Zuriel’s hashtag using the title, which was about girls’ education. Keep reading to find out more about Zuriel and her work! Zuriel got her start in filmmaking after entering the National History Day contest, an annual competition sponsored by the History Channel. The requirements of the contest were to do research on a historical topic and present it either as a paper, exhibit, performance, documentary, or website. Zuriel chose to do a documentary. She traveled to meet with Flight Lieutenant Jerry Rawlings, former head of state of Ghana, as her documentary focused on the Ghana Revolution. The film was released in 2012. For Zuriel, the most important thing she learned from the experience was an inspiration to create more films, and as of date, she has released five more films. This has taken her all around the world and given her access to exciting stories and people, and Zuriel is very busy. Balancing schoolwork with these events can sometimes be a challenge. Even though her films were at the beginning only about 10 minutes long and her last two documentaries were about 55 minutes long, the time it took to produce the documentaries was much longer than that. Take Follow the Ball for Education for example. Zuriel had spent the last three years working on the film. But evidentially, all her hard work has paid off. Zuriel has been dubbed the world’s youngest filmmaker by many. But for Zuriel, one of the biggest rewards is knowing that she is making a difference in the media. She gave a speech to the United Nations last year about the topic of climate change and the effect it has produced on the Pacific Island countries she did research on. 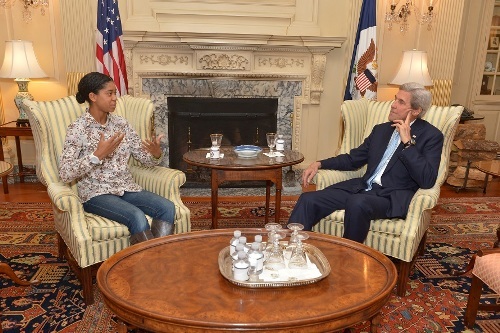 Zuriel speaks with U.S. Secretary of State John Kerry. Some of her prominent interviewees include former U.S. Secretary of State John Kerry, U.S. tennis superstars Serena and Venus Williams, and leaders of a variety of African countries. In 2014, she launched the Twitter hashtag #FollowtheBallforEducation, and almost 50 tweets were posted using that hashtag. The project itself focused on Zuriel taking a soccer ball across three continents and around 29,000 miles in an effort to garner more attention to girls’ education. To girls who are currently facing hardship in their countries, Zuriel encourages “them to fight, speak, and dig in.” She personally cannot imagine the hardship they’re going through—including being married off at just 13 or 14—and is rooting for them. Zuriel credits her family to having played a large role in her success. Following Zuriel’s break into the film industry, her dad resigned from his job in order to accompany Zuriel on her projects. The rest of her family are just as important. Zuriel’s mom is responsible for scheduling, and her sisters Azaliah, Arielle, and Isamaciah are her support system. When Zuriel is on a trip, she enjoys video calling her family back home. A seasoned filmmaker, Zuriel has taught filmmaking classes to 200 students in five different countries. One of Zuriel’s greatest rewards was when one of her students was able to create a 45-minute film using a borrowed camera. She has been featured in ELLE Quebec as part of their 33 women making a difference list. Zuriel was the youngest honoree in a list that included many prominent women serving their communities. Asked what the one thing she wished she could change in the world, Zuriel said it was “that girls are treated exactly the same as boys.” Zuriel has done a great job of representing girls with achievements such as becoming the youngest person—and girl—to be interviewed for Forbes Magazine and to interview so many world leaders. To fellow kids, Zuriel advises that they chase their dreams, even as wild as they may sound. Even in an event of a failure, she recommends to triumph over failure to truly succeed. And with December’s long breaks comes a perfect opportunity to overcome even what you think are your biggest obstacles.